The newly completed Cork Memorial Trust Medical Centre in Dorrigo is believed to be the first energy autonomous medical centre in Australia. Funded by the generosity of the late Cyril Cork the building has been leased to Dorrigo Health and Wellbeing and includes services such as General Practitioners, Laverty Pathology, a podiatrist, psychologist and visiting specialists plus the development will include forty three independent housing units within close proximity to the township for services and shopping. As the project is funded by a philanthropic trust to benefit the community of Dorrigo, expensive ongoing operating costs needed to be avoided. The design incorporates and Autonomous Services Package to meet the project’s needs. An additional aim of the Cork Memorial Trust is to provide opportunities for local tradespeople and local suppliers to benefit from the projects the Trust funds – this ‘challenge’ turned out to be one of the biggest benefits to the project. The uniquely designed building features cross ventilation, large thermal mass stores, double glazing, high rating insulation, natural lighting, low VOC paint, and a planted roof which all contribute to lowering heating and cooling costs. Excess solar energy production is stored for use at night instead of selling it back to the grid at a low rate, and can also be used for back-up during blackout periods. It is expected that due to the fluctuating weather and energy usage patterns the system will generate up to 20% more power compared to its total usage for the year. 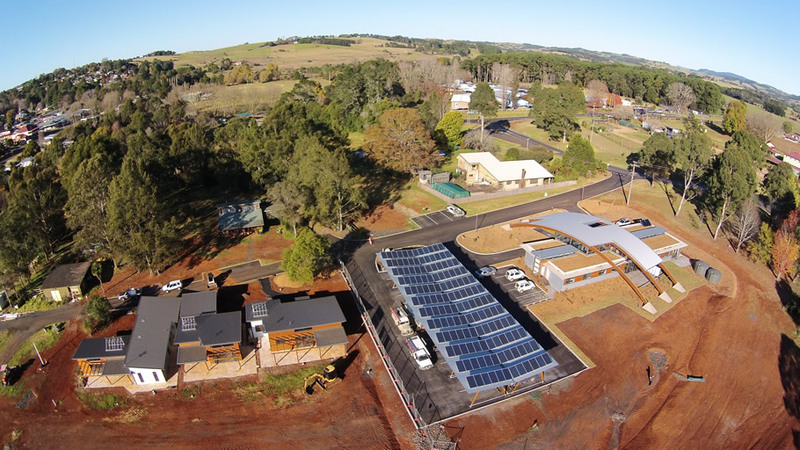 The medical centre is kept warm through Dorrigo winters by a heat pump hydronic system which is shared with the seniors’ housing development via an insulated underground hot water loop. Worm farm sewage system, stormwater polishing, and a rain water harvested water supply complete the Autonomous Services Package. The development utilises local materials and trades wherever possible. It was designed by Regional Architects, built by local builder Mark Moxon and Co. 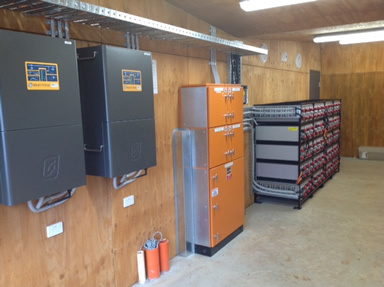 The development’s load profiling and electrical infrastructure was engineered by Kersten Schmidt from Enesol who also ran the competitive tender process, and the final Solar + Storage system was designed and installed by Geoff Tosio of Solar Depot Bellingen. “This iconic environmentally sustainable building is an example of the benefits of local knowledge and cutting edge technology which is able to provide environmental benefits and a fast return on investment for the Trust,” said Geoff Tosio from Bellingen Solar Depot.